Current Edition is available for $35 (price includes tax and shipping). Our comprehensive Michigan ORV Guide covers all areas of the State which have ORV access available. All open county roads are shown as well as the complete ORV Trail System. If you only ride trails, the Trail Map Book may be a better choice. This book can help with trip planning, connecting trails and much more. State, County, Local and Forest roads. Highways, County Roads and National Forest Roads open to ORVs visually highlighted. Designated ORV System. ORV Trails, ORV Routes, Motorcycle-Only Trails, Michigan Cross Country Cycle Trail. Public Land. State and National Forest, National Parks. Points of Interest. Gas Stations, Lodging, Campgrounds, Food, Parking Lots, GPS Coordinates, Trail Distances. Trail Guide. We've ridden every trail and provide an overview of the trail condition and features. These books are constanty updated througout the riding season. No big pre-productions here, each book is created on-demand. 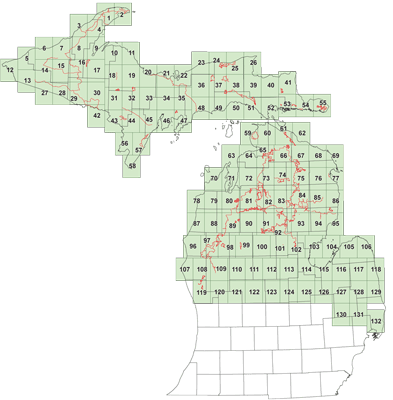 The Michigan Off-Road Vehicle Trail system is included in it's entirety. Both the upper and lower peninsula are covered. Over 3000 miles of trails! Even the connecting Michigan Cross Country Cycle Trails (MCCCT) trails. Current Motor Vehicle Use Map information included for all three National Forests. Each trail has been documented with a GPS unit, the most accurate product available. The book is 8.5" x11" and and the ~140 pages are wire bound for durability. Fits in most tank bags. It is not waterproof. Download this sample from the Guide Book (PDF) covering Newberry and Seney area. This book differs from our Trail Map Book of Michigan in that it is more of a plat book-style with continous coverage of all ears open to ORVs. The Trail Map Book has a trail on each page and does not cover areas without trails.